I have since 1996 participated in several conferences with paper presentations of my research in leadership, values, and responsibility. I'm giving a key note: 6th Nordic Church organisation conference on Churches and Civil Society, November 2018 (Århus University): http://conferences.au.dk/churchcivilsoc2018/ Call for papers. 8.-10. juli 2017. Conference: "Economic Theology": Paper: Guilt as curse and gift. 6.-10. juli 2017. 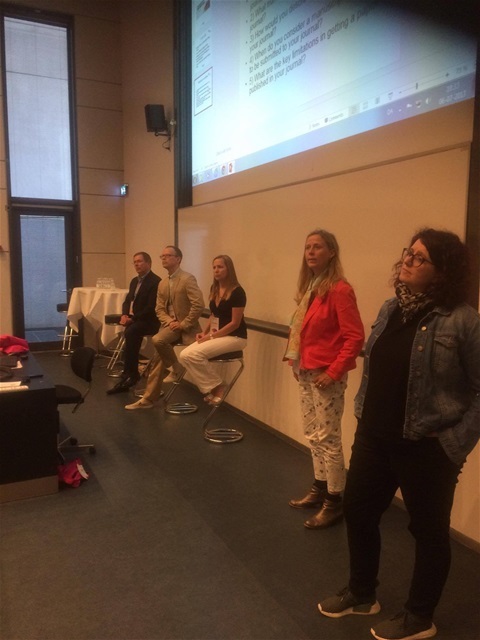 Conference: EGOS at Copenhagen Business School. I was chairing the session: Meet the editors: Martin Sheep (Human Relations). Martyna (Management and Learning). Allison Pullen (Gender and Work). Hans Hasselbladh (Scandinavian Journal of Management). July 2016, Berkeley: SASE. Paper: The gift to society. Comparing two centuries of gift-giving. August 2016, Bergen: Business History Conference. Paper: The gift to society. Comparing two centuries of gift-giving. February 2015, Kyoto, Japan. Business History Network. Responsibility and guilt in public leadership. October 2012, Bielefeld. Luhmann network: Responsibility and guilt in public leadership. August 2012, Trondheim. Kierkegaard network. 2011. Iceland ECPR. Paper: School leadership. Autumn 2010, Helsinki. Paper: School leadership. August 2010: AOM, Montreal, Canada: Seduction of leadership.